Let this be your home away from home! 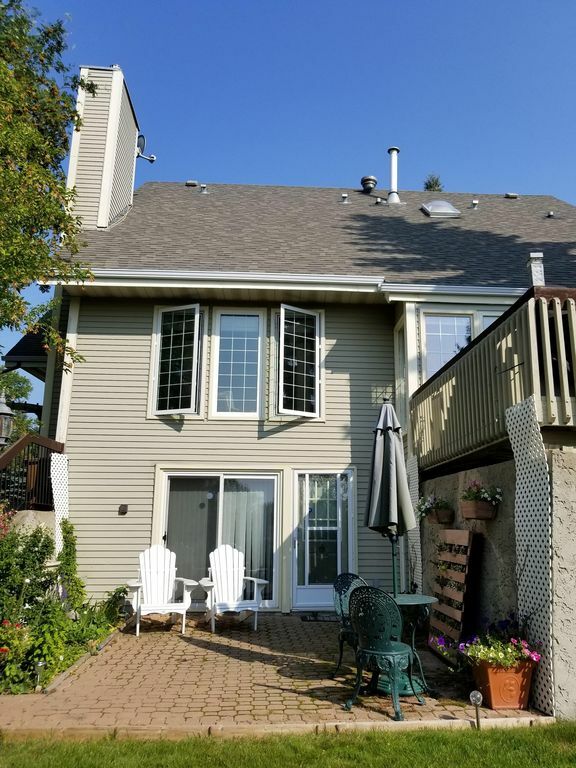 Great accommodation for single person or couple vacationing or on business in the Edmonton area who wish the comforts and conveniences of a home rather than an expensive hotel room. Ideal for long-term stay. Tranquil atmosphere in hillside, view property with walk-out lower level apartment suite. Separate entrance to your own private, self-contained apartment suite with all the amenities. Includes fully-equipped, modern kitchen and dining area. Suite has in-floor heating so rooms can be temperature controlled individually. Living room has a cozy gas fireplace, Full HD satellite TV with BluRay DVD. Complimentary WiFi. Laundry facilities available on request. Bedroom has a queen-sized bed and en suite bathroom with a tub and shower. Enjoy the private patio in park-like setting with expansive view. Minutes from the Anthony Henday making all attractions easily accessible. The festivals and attractions in Edmonton are nearby. Downtown Edmonton and West Edmonton Mall are only a 15 km (10 mile) drive away. Public transport in St. Albert and to Edmonton is one block away. Conveniently located in the quiet, scenic neighbourhood of Woodlands. Walking distance to parks, paved river trails, botanic gardens, and Servus recreational centre. Also close to Sturgeon Hospital, shopping malls, library, civic centre, supermarkets, restaurants, cinemas, museums, galleries and the Arden Theatre. Don't miss the Saturday market, the largest summer outdoor market in Western Canada! Your hosts, Joe and Liz, have traveled extensively and enjoy meeting people from all over the world. The suite was perfect. It was exceptionally clean. We instantly felt at home. The kitchen was outstanding. Bedroom had a very comfortable queen bed. This property was a real delight to stay at. It is in a quiet neighborhood and the home has a walkout basement which is where the one and only private entrance is located. The backyard is a peaceful park-like setting with beautiful flowers, lots of open space, and patio furniture to enjoy. It feels larger inside than its stated square footage. The owners were wonderful to deal with and they also provided us with helpful advice on attractions in and around the city. Definitely a first class experience all around for me and my family! Hope to visit again in the future! I am so glad I found this little home away from home! I came to Edmonton to visit my Mom who is in a senior's home there and needed somewhere comfortable to stay. Luckily, I came across Joe and Liz's lovely suite in St Albert. I had to drive a bit to get to where Mom lives, but it was well worth it. When I returned here at night after long emotional days, I was enveloped in a cozy, great feeling suite! It has everything you need for your stay as they have equipped it fully! Joe kindly lent me his GPS so I could get around...without it I would still be there looking for locations! It is very quiet and in a wonderful neighborhood that is safe and very pretty. I hooe to stay there again when I return in the fall. Thank you Joe and Liz! We spent most of the summer living in Joe and Liz's suite as we waited for our house to be finished. We had a lovely time. The suite is cozy and has all the amenities one could possibly need: kitchenette for cooking your own food, living area for hanging out, and bedroom with attached bath for sleeping. Joe and Liz were wonderful hosts as well, and we really enjoyed getting to know them. Overall, this is a quiet, convenient, and comfortable place to stay in the Edmonton area. Highly recommended! We were visiting family in St.Albert for two weeks and wanted to find a little apartment. We were very fortunate to have found this lovely place, it was very clean, very well equipped, we lacked nothing. We had our own patio outside, was very private and comfortable. Joe and Liz are super nice people who would be there for you if you needed help with anything. Would not hesitate to recommend this suite to anyone. Hope that we will be able to stay there again if we ever visit St. Albert again. This is a great place ! We stayed for two months when relocating from South Africa. The suite has a beautiful view of trees and hares ! Well furnished kitchen, plenty of bedding and towels, TV, DVD's and books. There is plenty of information about things to do and see in the areas of St Albert and Edmonton. Joe and Liz are perfect hosts, completely available but not intrusive.